The line attached to the long, green garlic worm moved effortlessly through the bullet-shaped slip-sinker. It then tightened as the big fish first mouthed my bait, and began to slowly swim away with it. I knew the worm had fallen into the middle of a huge pile of brush in about 10-feet of water. I also knew that as soon as I set the hook I would have to wench this horse straight up to avoid a hang-up. I prepared for battle. I think I actually started to wind the big reel before the steel was driven home. I could feel her head turn upwards as I gathered line as quickly as my outfit would allow. As she cleared the brush she turned nose-down and ran back for the cover of the sticks. My graphite rod groaned as leaned back to force her head up once again. This time she turned as ran right for the boat. I was able to avoid slack in my line. If I had not, she would have certainly thrown the hook. She fought hard until she saw the boat, then she fought really hard. Again she headed for the safety of the depth and of the brush. She turned more easily this time. Her own body weight was adding to her fatigue. Soon I had her by the lip and hefted her into the boat. She caused my digital scale to read 8:07, and that does not mean 7 minute after 8 o�clock. 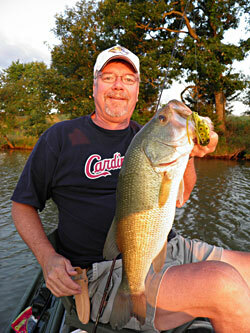 Catching big bass is not as difficult nor as rare as many fisherman think. 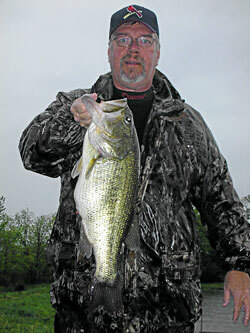 I know serious bass anglers who catch 100 bass a season over 5-pounds. I know others who have fished for years and still have never landed a 5-pounder. Why is that? Is it luck? I think not. Is it skill? I think not. I believe perseverance is this single biggest factor in catching lots of big bass. I cannot coach you on �stick-to-itivness� . Therefore we must look at the second most important factor in catching these big fish regularly; that being knowledge. The largemouth bass lives in every state except Alaska, and in many foreign counties. They prefer ponds and shallow lakes, slow-moving rivers and streams and reservoirs with lots of timber. They are found most often near submerged logs, brush and vegetation. Largemouth bass eat many different meals including minnows, small bluegill, and crawfish. The world record bass weighed 22-pounds, 4-ounces and was caught in Montgomery Lake, Georgia. Knowing the bass is crucial. Knowing what he likes and dislikes will make you a better bass angler. Following a bunch simple tips that, when combined into a bass fishing program, will help you catch bigger bass more often. Bass and people see colors about the same. 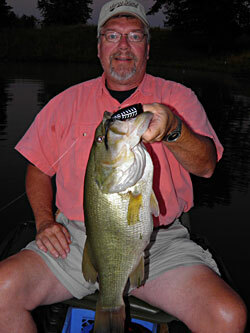 Therefore, clear water allows bass to see more detail in a lure. Under these conditions use a lure that looks just like the prey that bass are feeding on, whether that be shad or crawdads. In cloudy, stained water use flashy, bright colored lures that can be seen for longer distances. The new neon colors work well in these conditions. Everything in the water has a life-cycle. Fish, insects and plant life all have times of natural beginnings and endings. Try to locate the first aquatic plants or weed beds that appear in the spring and the last ones to die-off in the fall. Bass will often school around them in large numbers. The most effective way to catch big bass is to accurately imitate the prey they are feeding on. When a bass chases a minnow, the minnow does not swim away slowly. It darts in every direction to try to evade the predator. To mimic this action, bump your lures off rocks and stumps or the bottom. This changes its direction and speed and makes it appear more like an escaping minnow to a hungry bass. When you lose the bite or when it slows way down, try switching to smaller lures. Down-sizing from a 10-inch worm to a 4-inch worm may draw strikes that the bigger bait might miss. The old adage that �bigger baits catch bigger fish� holds water, but not all the time. Quite often a snack looks better than a full meal. A large portion of the bass fishing in our region is done is rivers and streams. Current plays a major role in deciding where to fish for largemouth bass in a stream or river. These big bass do not like current and will usually stack-up in back-waters, eddies or close to objects that deflect the current. Sunken logs, bridge pilings and boulders are likely spots. Largemouth bass are very unlikely to chase a lure into fast moving water. In the summertime, lilypads and matted surface weeds provide perfect cover and great ambush spots for big bass. Try weedless plastic frogs, mice or rats in a skipping presentation on these weeds. The key is letting the fish have plenty of line after the strike before setting the hook. Be patient. If you set the hook too quickly, you will usually pull the bait away from the fish. Do not be fooled by what you see. Wait until you feel the bass on your line to set the steel. In clear water, the success of artificial lures often declines during the middle of the day. Bass can see much more clearly during this high-light period. Since no lure looks as good as a the real thing, bass may reject the lure. Live-bait bass anglers tend to do very well in the midday because their baits not only look like the real thing, they are. These are just a few of the hundreds of pieces of bass knowledge that separate the successful anglers from the rest. There is no substitution for the combination of knowledge and perseverance.